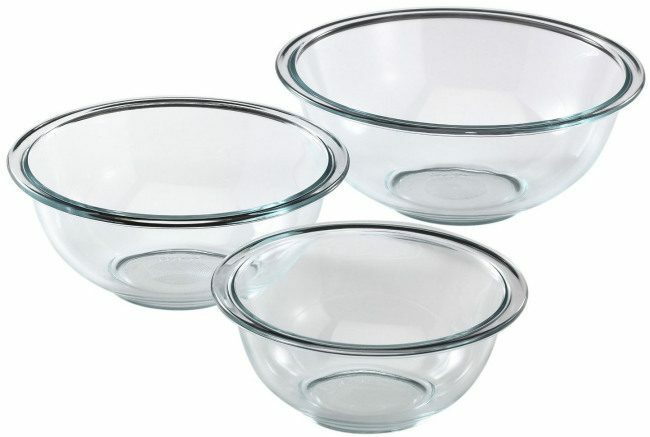 Pyrex Prepware 3-Piece Mixing Bowl Set Only $11.99 + FREE Prime Shipping! You are here: Home / Great Deals / Amazon Deals / Pyrex Prepware 3-Piece Mixing Bowl Set Only $11.99 + FREE Prime Shipping! Need some new mixing bowls? We have a nice deal on Pyrex bowls going on right now! Get this Pyrex Prepware 3-Piece Mixing Bowl Set for just $11.99! That’s just $3.99 per bowl! And, shipping is FREE with Amazon Prime or Super Saver Shipping! This would make a great addition to your kitchen or would make a great gift for someone for the holidays!